I’ve done a couple things this week. Some more memorable than others. I dumped two batches of beer because I didn’t find them ultimately going according to plan. Thats the problem with experimentation. While the learning is incredible useful, its also frustrating. I dumped the all-wheat beer. After my brewing partner(Leigh from Mop Top Brewing) finally got to try some we decided that while the experiment was successful in that we did indeed make an all wheat beer, we didnt end up liking it at all. Perhaps it was a tannin leach or something, who knows. I also dumped a much younger beer, a Bavarian Hefe. I tried some new grains in it as well as a different percentage of wheat to pilsner malt. I gave it two weeks in the fermenter and when I racked and tried it I just wasn’t feeling it. The clove or banana flavor wasn’t there, the body was a little too light for what I was shooting for. I also suspect I may have extracted too many tannins with my sparge process. I need to do a recalibration. Maybe this wednesday before thursday’s brew. I did recently re-passivated my vessels 2 days ago, but its good to check and make sure PH Meters are calibrated, as well as thermometers especially. about 17 days in Primary it was time to put in a Keg to purge of oxygen and lager for 30 days. That should be ready to drink on June 14th. It tasted awesome on first taste. Came out a bit strong – closer to 5.6%, but I think it will be a great summer beer. I also visited a couple breweries this week. My wife and I went to The Bruery in Placentia, CA yesterday. Great time. I tell ya, for how expensive their bottles are, they sure have a great AFFORDABLE tasting room. Each sample of 50-some odd number of beers is only $1. So, for example, a 5-flight sampler is $5. Its great! I also went with Leigh to San Diego where we enjoyed Rip Tide, which was pretty great and we also hit up Belching Beaver Taproom. Then we went to the great 7bbl room just a bit north of downtown San Diego known as Pure Project. They were amazing! thier brewmaster, Winston, has concocted some of the best beers I’ve had in a long time. Wow! We also went next door to Amplified Brewing. Not nearly as good, but they show potential. They have the ‘look’ down, just need the product(beer) to get a bit better. Everything had a smokey tinge. Its probably no surprise that one element that contributes to the successful act of repeatability is proper measurement techniques. I recently came across one such issue with incorrect measurements while creating a yeast starter. 9 of 10 of the beer we make are ales. And, being that a lot of these are 5-10 gallon batches we can usually use a 2-Liter starter. However, this last brew of ours, a Munich Helles, required a much bigger starter. almost 3.5 liters. The 5-Liter flask normally used for such a thing unfortunately had a crack running down the side of it. As such, I quickly broke a new one out of the box, cleaned it, and filled it up to the 4L Mark and poured that into our pot. Something just seemed…off. I grabbed the 2 Liter flask, which has been quality scrutinized by myself in the past. I filled it up once to the 2L Mark, and poured it into the 5L Flask. I then repeated it again. I should have been just about filled up to the 4L tick mark on the 5L flask. Instead, I noticed that the water was hovering just below the halfway mark of 3 and 4L. It was closer to about 3.4L. “Hmm, thats strange.” I thought. I went back and performed the same test. Same result. I then placed the 5L flask on the scale, and filled it up with 35oz of water – about 1 Liter of water. Sure enough, it was off the mark by almost half a liter. The same was true for 2 and 3 Liters. Is this the Flasks fault? Sure, to some extent it is. But, it is also my fault for being hasty and not double checking my own equipment before using it. I’m usually really good at that stuff, but in a pinch I for-went the rules. Luckily, was able to catch this before I pitched wrong amount of yeast into the beer, which depending on the style can have bad styles. Especially if its under pitching. But, think about these things when it comes to other important measured additions. Like hops, or mineral additions. I guess the moral of the story here is: double and triple check your measurements. It will play a big part to repeatability on other systems or when scaling up/down your own recipes. Clockwise from top left: White Wheat, Melanoidin, Red Wheat, Pilsner. Today was a good day to brew. There was nice cloud cover, the termperature was nice, and the beer ingredients were fresh. In my ongoing quest to create the best Bavarian-style Hefe I can I did a few new things here. I had read somewhere that sometimes the different wheats(white and red) are mixed to ‘fill in gaps’ in the flavor profile that might be missed by one. I also believe personally that head retension is better with red wheat. Second, I added Melanoidin to simulate a decoction mash. I feel like this quest of mine is going to end with my just breaking down and doing a triple decoction mash. Which will take 3 times longer I’m sure. My quantities were pretty standard for these grains and this style. Over all, 60% of the grain bill was wheats, 36 percent was pilsner, and an even 4 percent was the Melanoidin malt. As far as hops, I had a few choices of what to use, but I decided to use Hallertau Mittelfruh hops for both bittering and aroma – remember, with traditional hefes, you don’t really much of either of those. These weak 3.2 AAU hops should do the trick. Saccharification rest – 152F, 60 mins. Any ideas? I havent seen this before – remember, this was BELOW the false bottom in the mash tun. My fear is that it got caked onto the bottom and the direct fire may have charred it and that would affect color, flavor, etc… I’ll find out in 3 weeks. The boil was great and vigorous. My efficiency was a bit lower than the 80% I’ve been getting. I blame it on the milling. I got closer to 76% this time. I’m fine with that. I’ll post a photo when its good and done. I dont use fining agents, so I am expecting a haze-monster, but, its a hefe..
Project Codename: “Ale Force One”, is finally done. It is now called simply and appropriately, “100% Wheat”, because that is what it is. It also has a generous amount of Elderado hops on top of a strange funky Forbidden Fruit yeast. Our water profile follows Orvals water, which means it has a crazy amount of bicarbonates. Our PH was within range, but the high end. There were no fining agents in this beer either. LOOK: Color is a nice pale hue. SRM 5, or thereabouts. Its hazy as all get-up. The head was foamy and frothy and died down after a minute to a bubbly spittle looking head. AROMA: The aroma is typical belgian phenolic and somewhat medicinal and also very citrus hoppy. Its the product of strong hops in a funky style with all wheat. That said, its not really too bothersome. TASTE: The taste is also very hop forward and really lemony tart. Again, a product of the yeast and wheat, methinks. MOUTHFEEL: Medium body. Drinks well enough. FINISH: The finish is like a lemon spritz at the back of the throat and some hop bitterness. OVERALL: I think for a first run Beta-Beer I would rate it a success in that what we ended up with is not something I WOULD not expect from the ingredients involved. I would ask for a sample of this at the pub but I would not order it. FINAL VERDICT: 4/10. I will keep this on tap for another month and give it another whirl. If it hasnt improved after that, and I do not expect it to, I will be submitting this one to the great below…down the sink. Two things happened over the course of the weekend. 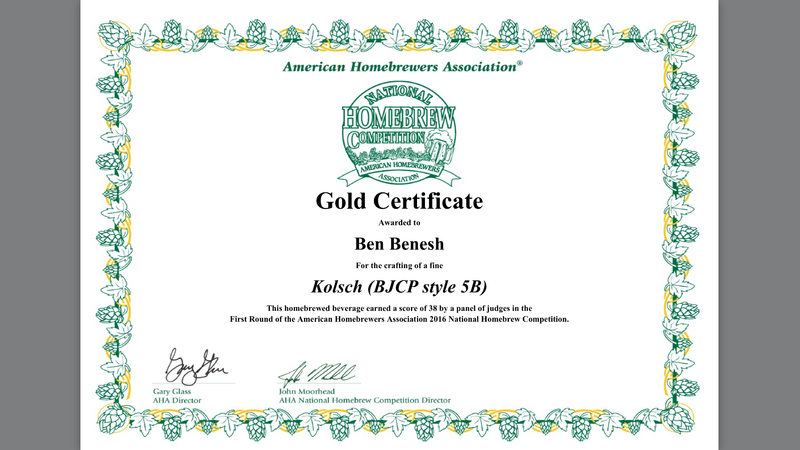 1st, on Friday the 29th, I received our National Homebrew Competition San Diego results. 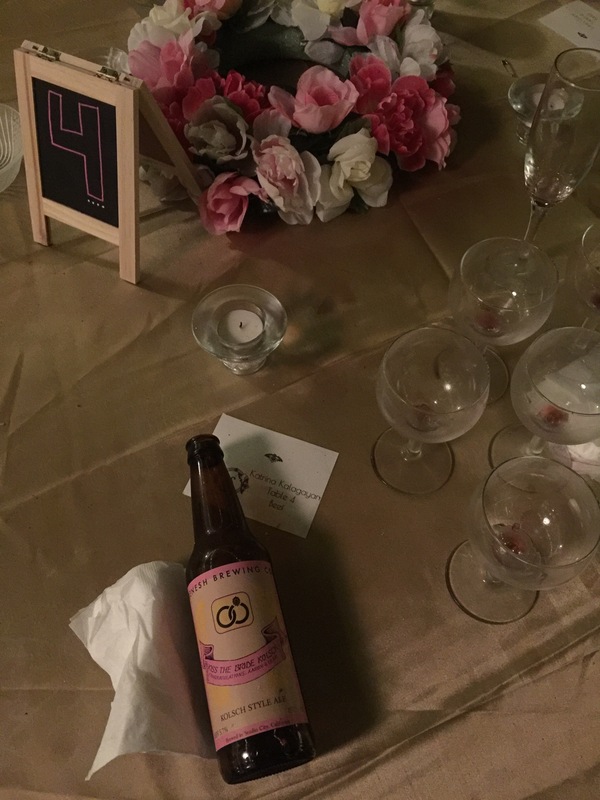 2nd, that wedding that I brewed two beers for officially came and went. I’ll start with the competition, as it was the least important of the two. I entered three beers: Basic Kolsch, Laurale Pale Ale, and The Creamator. Two of those beers had problems that I could see before entry, but you have to enter what you have; if anything for the critiquing. Creamator got a Bronze Certificate, with a score of 29.5 – that’s better than I thought honestly, and I still feel bad those guys had to drink it. Laurale Pale Ale(version 2 of 3, I might add) got a Silver Certificate with 30.5. That, too, is better than I thought, as this beer was brew-day to bottle in 10 days. About a week quicker than I would have liked. 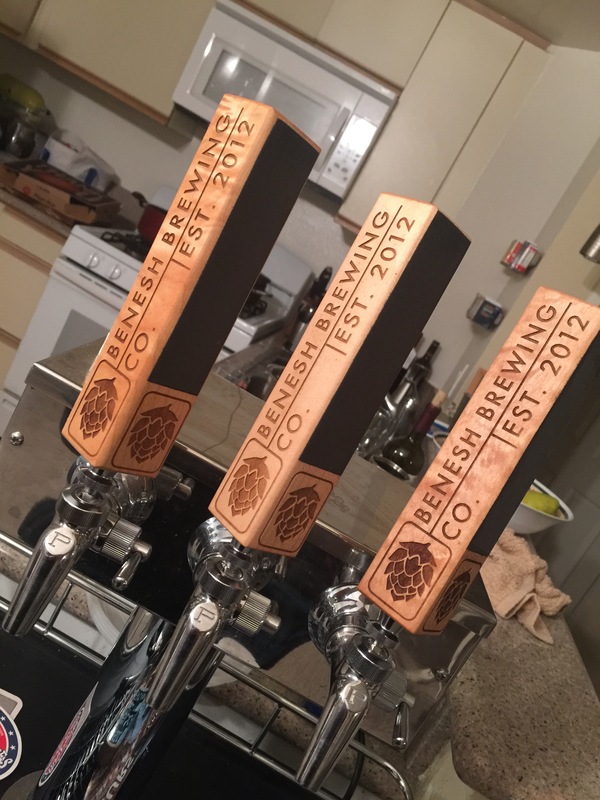 Basic Kolsch, however, is something I’ve been working on for a while. My first Kolsch was many years back when I was young and adventurous and stupid. I decided I was going to brew a “chocolate Kolsch”. My more knowledgable self knows that within the specific guidelines of Kolsch Style beer one cannot change what makes it what it is. It’s like saying: “I’m going to make this a chocolate flavored vanilla!” To which you reply, “no, you will make a chocolate or a vanilla but one cannot be the other.” There are other beer styles suited for that kind of tampering. So, several lessons learned and batches later, I did improve my Kolsch. At NHC, it scored 38.5, rendering it Gold Certificate and a Mini-best of show placing. While still not a medal, I am happy with the overall results. Ive never entered NHC before, and I hear San Diego is a really tough market. The Wedding went off without a hitch(as far as spectating is concerned). I brought in my donated beer and it went fast. I got a lot of compliments as well. 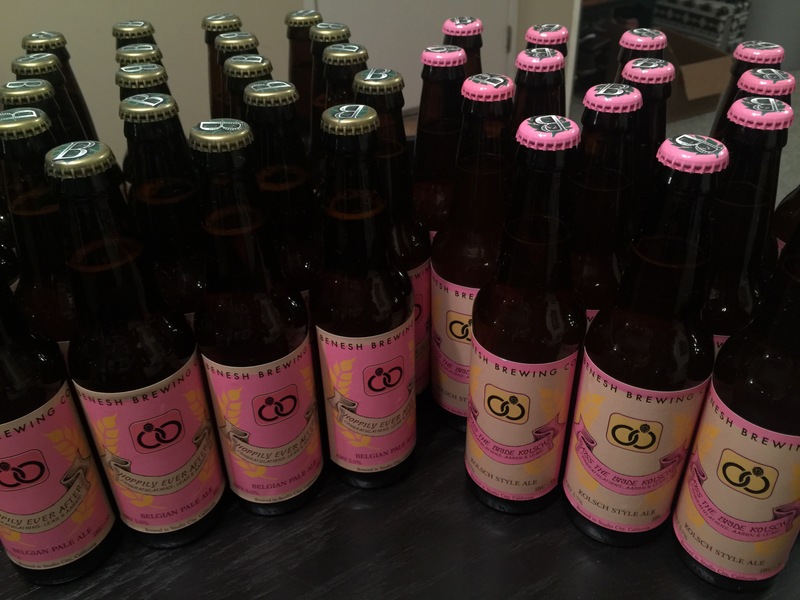 I am still skeptical that it went fast because bottles were being hoarded away for sentimental value – I’m pointing the finger at you, brides family! As you can see in the first image, the beers were quickly consumed and left for dead. Great wedding though. Congratulations, Brother and Wife! This Hoppily-Ever-After beer seen here is actually repackaged Laurale Pale Ale(ver 3). If NHC could have tried this one, which had a proper creation cycle, it would have done much better I feel. Oh well, next time. I’ve got a Helles, Hefe, and Stout to make…till next time! 420 = Pot Day. Brew Pots, that is. Sue me. I’m 3 days late for 420, but the truth is I did want to talk about Pots today. Both Mash Tuns and Brew Kettles. I’ve read a lot of things recently that people are saying about not needing to worry about cleaning their mashtuns because everything is pre-boil. They also say the same about brew kettles because, they too, will be boiled. From a purely bacterial standpoint, they would be correct in that most(though, not all) bacteria cannot survive boiling temps. But, I think an equally important consideration is what potential off-flavors from left behind stuff is now being imparted into your future brew? Even the thinnest of crusts baked on a kettle or the smallest amount of four-brew-old chaff wedged into your false bottom can have a noticeable effect on your beer. These left-behinds can affect color, or perhaps an unintended caramelization leading to characteristics not planned in your beer. All this will effect repeatability. These are things to consider. Please, wash your kettles out, wipe away the crusts and the nasties in the mash tun. A simple hosing down wont do it most of the time. Besides, it takes 10 minutes at most. Remember, YOU wanted to be the homebrewer, who would, in turn, pass homebrews to your friends and tell them you know what you are doing. Grab a blue Scotch-Pad and use the soft side on plastic Igloo-Type mash tuns. For stainless steel, flip that pad over and use the harder blue bristle side. Speaking of steel, what about passivation? Passivation is just as important as cleaning your kettles. Laymens Terms: Passivation is the process of creating/maintaining the invisible layer of protective coating on stainless steel that helps prevent corrosion. If your kettle were a sculpture in a yard, you probably wouldnt have to worry about this so much, but since we are using these kettles like they are workhorses, things can and do happen that can stress out and strip away this protective coating. Big metal spoons clanging around when we stir our wort. Portions of these kettles are subjected to 1000+ degrees F. You get the point. So, how do we passivate? Bar Keepers Friend. The best $4 you can spend on maintaining your kettle. Again, here is the Cliff Notes version that may or may not be as accurate as I would like it to be: Mix the powder into a thick slurry, rub it all on your kettles with a blue scotch pad. BKF will strip away the worn out old invisible coating I mentioned earlier. Wash the stuff out with a hose or in the sink then wipe it dry. Through a certain type of metallurgic science-y process, as the product dries this invisible coating is reformed because of the magical ingredients in BKF. Instantaneous, too. Here is the simple test to see if its worked, pour some water on the recently passivated part, it should bead up and drip off in sheets, almost like water on a newly waxed car, leaving a nearly dry surface beneath. I shall demonstrate how GREAT this product is at cleaning up a messed up kettle subjected to a badly designed product, the DARKSTAR 1.0 Burner. See what an amazing cleaning job this stuff does? You’ll also notice I am clearly using a green/yellow abrasive pad in those photos. That is bad practice. ALWAYS use the blue as it is gentler on plastics and metals. Especially if it comes to cleaning fermentation vessels. Also, I just want to point out, the DarkStar 2.0 Burner(Below and right) is really a great product and SUCH an improvement over the first one. Pictured to the left. The Darkstar 1 has that crappy economy burner that is prone to create ridiculous amounts of soot, as seen in the first picture above. This was my first time using Darkstar 2 to keep warm a recirculating 10 gallon mash. It didnt leave any mark. Daddy like. So, if you are in the market for a budget burner, I would gladly endorse the Darkstar 2 for heating lauter tuns and mash tuns. I don’t know if it has the bolas to power a 10 or much less 5-gallon boil and I don’t really want to waste the time and potential resources finding out. Let me know if you find out though! Thats pretty much all I’ve got today. Just in case anyone was curious what I might have been brewing. A Muenchner Helles, which colloquially means: “Munich Light-Colored Beer” Don’t be afraid by the Light term, its purely for color of beer in this case. If you havent had a Helles, I definitely recommend it. Closely related to a Pilsner but more malty and less hoppy(though with todays IPA’s, would people consider Pils hoppy anymore?). 2.5 percent Munich Light Malt. Very small amounts of German Nobel Hops. Hallertau Mittelfruhs. This thing must ferment at 48 for a while, then a small raise and then a Lager period for 8 weeks. Brew day went well, now its up the yeast and the Johnson Fridge Controller. Two new beers: The sampling. It is definitely with good news that I can report that our two newest beers, our belgian pale ale and our 100% wheat ale, have finished primary fermentation within a few points of their final gravity. Our mash efficiency has been floating a few points above our software predictions over the past 10 batches, and rather then update the system a set figure we are averaging out the differences in order to hopefully have a more accurate system overall. Point being, we are still at a point in the process where our gravity differential still is creating beer that is slightly more alcoholic then anticipated. Onto the interesting stuff here though, the tasting. Our Belgian Pale Ale turned our exceptionally well. It fermented for exactly 20 days. After 5 days of force carbonating, it is easy to detect the final product. The home-made belgian candi provides a nice dry caramel flavor. The Belgian Ardennes yeast bring out a nice sweet flavor that works with the malt to create something similar to Delirium Tremens but not as alcoholic. Our beer ends up at 5.4%, where as a Tremens, definitely an inspiration for this beer, finished somewhere in the 8 percent range if memory serves me. Moving onto the elephant in the room, the 100% Wheat beer. It is still fermenting. 10 days in the chamber now at 64%. I will let it ride out one more week in there. In two more days I will dry hop it with some El Dorado hops for a few days. I did however rack a sample out big enough to try a bit and, of course, do a gravity read. The gravity has hit within its point range. How does it look? Hazy; to be expected. There were no fining agents in this beer. How does it taste? Phenolic. It is all wheat and our yeast, Forbidden Fruit is known to create this in wheat grain bills. It is smooth though, and the flavor is quite interesting. But hard to place. I do hope that dry hopping will add more citrus to the aroma and not complicate its already complicated but palatable flavor. They are nice and, what I think is, laser-etching on beautiful walnut wood. I paid a couple extra bucks for a chalkboard painted side so I can write the name of the beer on them. They are really quite impressive. Rolling Rock. From the glass lined tanks of Old Latrobe, as they say. DMS has always been explained to me as the cause of a Creamed Corn-like aroma – even this podcast mentioned as much. Well, let me tell you a secret. When I got into beer so many years ago Rolling Rock was “my beer”. I don’t know why it became that, but it did. Some people chose Bud Light. Some Coors. Some New Castle. But of all the under $10 12-packs out there, Ro-Ro’s became my beer. Fast forward many years, and I don’t think I’ve had one in at least 8 years. So I decided to do an experiment. I went to the store and I picked up a sixer of Rolling Rock and a can of creamed corn. I opened the creamed corn, gave it a whiff then let it sit for 10 or 15 seconds and gave it another whiff. Then I cracked a Ro-Ro and did the same thing. I’ll say this first off. I think a better description would perhaps be that DMS might vaguely be similar to a creamed corn aroma but it is definitely by no means identical. Secondly, I’ll say this: I really enjoyed drinking that 125 calorie-per-12-ounce beer-flavored carbonated water known as Rolling Rock just as much as I did nearly a decade ago. It was cool, crisp, watery and subtle. Would I drink it every day? Hell no. But, the nostalgia factor certainly plays into my enjoyment of it. You never forget your first, they say. I asked some of my friends what their guilty pleasure beer was. I got the usual range of answers. A couple Coors. A Pabst. Bud Light Lime. I cant say any of them particularly strike me as better than the other, personally. With the rate that things are selling out to MillerCoors and InBev/Annheiser Busch, maybe everything is destined to become a watered down guilty pleasure beer. God…lets hope not. Anywya, what is your guilty pleasure beer? Come on, I know we’ve all got one.